Chesapeake Region Now Has an Online Searchable Native Plant Database – Sarah Morse of the Little Falls Watershed Alliance, writing about the new plant database, points out that, “Replacing portions of lawn areas and typical landscapes with native plants that suit local conditions reduces or eliminates the need for fertilizers and pesticides which wash into our streams, rivers and, ultimately, the Chesapeake Bay.” The new plant database, developed jointly by the Alliance for the Chesapeake Bay, the U.S. Fish and Wildlife Service and Image Matters LLC, will assist area property owners and landscapers in identifying plants that will thrive locally without those pesticides and fertilizers. An Environmental “First” for Maryland Public Schools – The Maryland State Board of Education voted last week to add a new high school graduation requirement in environmental literacy for all Maryland public school students. Maryland will be the first state in the nation to enact such a requirement. According to My Green Guide Maryland, “public schools will be required to infuse core subjects with lessons about conservation, smart growth and the health of our natural world. Local school systems will have flexibility in how these programs take shape in each county, but all will align with standards set by the State.” The No Child Left Inside Coalition, closely aligned with the Chesapeake Bay Foundation, and the state government’s Partnership for Children in Nature, all worked to make the new requirement a reality. A New Tourist Attraction in Atlantic City: Wind Turbines – Jacqueline L. Urgo of the Philadelphia Inquirer reports, “Some casino hotel guests are so fascinated that they ask for rooms with a view of the five delicate fans…” There is so much interest in the 385 foot turbines that the Atlantic County Utilities Authority will offer twice-weekly tours of the facility during June, July and August. The turbines, along with a solar array, provide 65% of the electricity needed to power a wastewater treatment facility located on a coastal salt marsh. The facility treats 40 million gallons of wastewater a day. More information and a contact telephone are available at the Jersey Shore Guide. Founder of Bkind Vending Profiled in Bethesda Magazine – The photo of Jason Schwartz is that of a man who takes his business seriously. He’s walking around Bethesda in a bee outfit and a wicker basket, presumably full of healthy snacks. Jason founded Bkind Vending last year to distribute a line of snacks he would be happy to buy for his own kids. Bkind is part of the Bethesda Green Business Incubator, which provides support to green, socially responsible companies. Read about Schwartz and Bkind on pages 46-47 of the July/August Bethesda Magazine. Green Night at Big Train Baseball Wednesday, June 29, 6:30 pm. Treat yourself to an evening of fun, friends and green information. Game time is 7:30 at Shirley Povich Field in Cabin John Park, but come early and meet Bethesda Green staff and supporters, as well as Dartmouth College’s amazing Big Green Bus and our friends from Honest Tea. BG 101 Thursday, June 30, 4 – 5:30 pm. Bethesda Green’s monthly orientation session. Learn about Bethesda Green history, programs, upcoming events and volunteer opportunities. Greening Condos Series, Session 5 Wednesday, July 6, 7 – 8:30 pm. 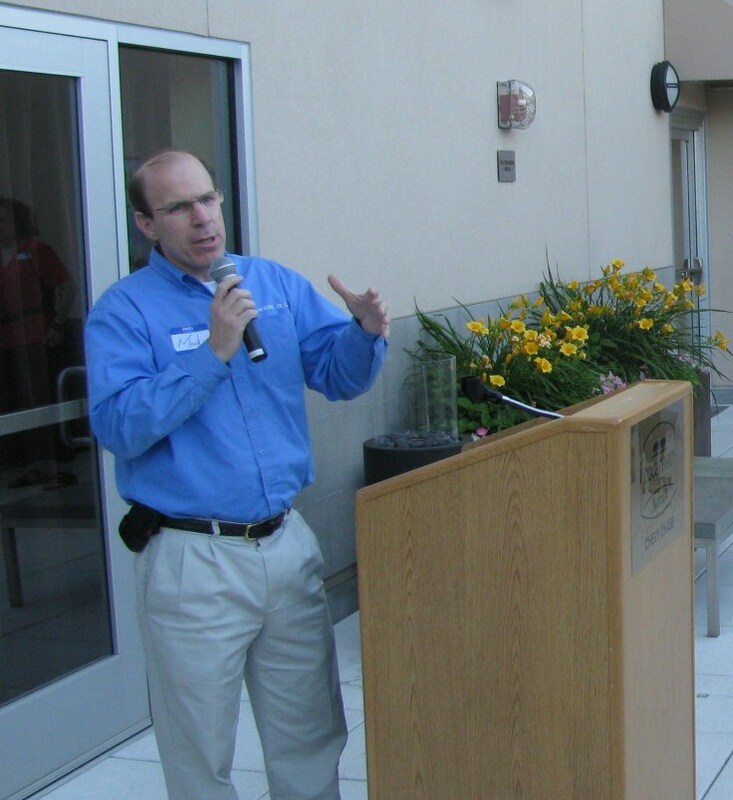 The topic of this free Bethesda Green and ecobeco educational session for condo owners and residents, condo boards and property managers, is Eco-Friendly Exteriors – Solar PV, Solar Hot Water, Green Roofs, and eco-Landscaping. Seating is limited. More information and RSVP here. Clean Water Innovations Trade Show Wednesday, July 13, 10 am – 3 pm. The Maryland Department of the Environment is hosting the 1st Annual Maryland Clean Water Innovations Trade show in Baltimore. This free event will provide a forum for professionals and stakeholders from around the State to display innovative storm water management and water quality management techniques, exchange information, and promote the protection of Maryland’s resources. Please R.S.V.P. by June 28. Mid-Atlantic SPROG July 31-Aug 7. The Sierra Club Student Coalition annual summer training program for student environmental leaders is accepting applications. High school and college students will spend the week at the Hard Bargain Farm in Accokeek, Maryland, learning to organize and manage environmental campaigns. They will also meet like-minded students from around the mid-Atlantic area and most likely have a great deal of fun. Capital Bikeshare May Be Coming to Rockville Next Year – According to the Washington Post, the National Capital Region Transportation Planning Board approved the use of a $1.9 million Federal grant last Wednesday to fund the expansion of the Capital Bikeshares program into Rockville. The plan calls for 200 bicycles and 20 docking stations at Metro stops, Rockville Town Center, Montgomery College and Rockville Pike. The program now serves 13,835 annual members in DC and Arlington with 1,100 bicycles. Grant money will be used to pay for memberships for low-income Rockville residents. How Did Your Representatives in Annapolis Vote on the Environment this Year? – Environment Maryland has published its 2011 Legislative Scorecard, created in conjunction with the Maryland League of Conservation Voters. The scorecard lists each State Senator and Delegate’s votes on several key environmental bills. Bethesda’s State Senator Brian Frosh scored 100% in favor of the environment, as did Bethesda Delegates Ariana Kelly and Susan Lee. Delegate Bill Frick scored 80%. A PDF file of the scorecard, with summaries of each bill and scores for all Maryland Delegates and State Senators can be found here. Major Announcements about Electric and Hybrid Production from Renault-Nissan and Ford – With all the news media focused mercilessly on a certain New York Congressman recently, you might have missed the June 9 news from Ford Motor Company about their plans to triple hybrid production and introduce a plug-in by 2013. That would mean an output of 100,000 EVs and hybrids a year. Not to be outdone, Renault-Nissan’s CEO told Wired.com he was ready to invest $5.6 Billion to build 500,000 electric cars a year by 2013. These are aggressive (and impressive) plans when you consider total electric car sales worldwide in 2010 came to 20,000 vehicles. Bethesda Solar Expo – Saturday, June 25, 10 am – 4 pm – Bethesda Green invites you to the second annual free solar expo. Get your questions answered by solar experts, local solar contractors and neighbors who have switched to solar power. More information and pre-registration here. Green Night at Big Train Baseball – Wednesday, June 29, 6:30 pm – Treat yourself to an evening of fun, friends and green information. Game time is 7:30 at Shirley Povich Field in Cabin John Park, but come early and meet Bethesda Green staff and supporters, as well as Dartmouth College’s amazing Big Green Bus and our friends from Honest Tea. BG 101– Thursday, June 30, 4 – 5:30 pm – Bethesda Green’s monthly orientation session. Learn about Bethesda Green history, programs, upcoming events and volunteer opportunities. Greening Condos Series, Session 5 – Wednesday, July 6, 7 – 8:30 pm – The topic of this free Bethesda Green and ecobeco educational session for condo owners and residents, condo boards and property managers, is Eco-Friendly Exteriors – Solar PV, Solar Hot Water, Green Roofs, and eco-Landscaping. Seating is limited. More information and RSVP here.